Enjoy Bar Harbor Clam JuiceGlass . When It Comes To Authentic Maine Cooking, You Can^^T Go Without Clam Juice - The Perfect Starter For Chowders, Bisques, Soups, Broths And More. Use This Clam Juice To Add That Extra Bit Of Rich Flavor When Baking Fish, Or As A Substitute For Water In Your Favorite Seafood, Soup Or Chowder Recipes. 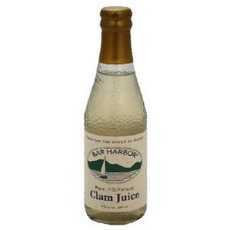 Bar Harbor Clam Juice Also Works Great As An Ingredient In Bloody Marys, Or, As They^^Re Called In Maine, Bloody Caesers. At Bar Harbor, This Clam Juice Is Made From Whole, Premium Clams, Not Leftovers Or Discards. These Juicy Clams Are Chopped, And Then Hand-Filter So There^^S Never Any Grit Or Sediment - Just A Pure, Homogenous Mix Of Great Tasting Clam Juice, From Clams Harvested From The Cold Waters Of The North Atlantic. (Note: Description is informational only. Please refer to ingredients label on product prior to use and address any health questions to your Health Professional prior to use.